The Halo Vault: Bottlinger's rings! At last they are here: good photographs of Bottlinger's rings! Tim Stone's images of Bottlinger's rings over Illinois were published today in Les Cowley's site ( 1 ). The rings lasted only for a few seconds, but luckily Stone was already taking photos of the subsun when the rings appeared, and the phenomenon became captured. The original observation was made by C. F. Bottlinger during an air balloon flight on 13 March 1909 over Göttingen, Germany ( 2 ). The phenomenon lasted long, from 1 to 1½ hours. Bottlinger suggested that the ring could form from a reflection in crystals falling in pendulum motion. Computer simulations by Lynch et. al. in 1994 ( 3 ) showed, however, that this motion would produce uniform elliptical glow instead of defined ring. As an alternative they suggested plate crystals in gyration motion for the explanation. Intuitively it would seem unlikely that all ice crystals in the cloud would fall exactly in the same inclination angle to produce Bottlinger's rings. Bottlinger's rings form in the same Altocumulus virga as elliptical halos around the sun, for which pyramidal crystals with very low apex angles has been suggested as an explanation by dutch S. W. Visser in 1960. These crystals would produce also Bottlinger's rings. The gyrating crystals could make elliptical halos by assuming that they are reflections of the Bottlinger's rings from horizontal plate crystals. This was suggested by Lynch et. al. Simulations by Sillanpää et. al. in 1999, however, showed that this can not model the observed elliptical halos, while pyramidal crystals yield much more satisfying results. A photograph taken by Claudia Hinz ( 4 ) also clearly proves that elliptical halos are not reflections of Bottlinger's rings. These two halos have not been observed simultaneously, but an almost simultaneous observation was made by Leena Virta and I in 1999 in Resolute Bay, Canada. We observed Bottlinger's rings from an airplane that was flying under the Ac cloud layer and when the plane landed, the same cloud showed elliptical halos around the sun. Tim Stone's photos show also fainter ring outside the main ring. Assuming the gyration explanation this would require two ice crystal populations with constant inclination angles. It will be interesting to try to simulate this with pyramidal crystal model. Les has already a simulation on his site, but he says the parameters could be fine tuned. The rings' dimensions and sun elevation are provided, so anybody can give it a try! This might be the first exclamation mark that I see in Marko's blog postings. The Bottlinger's truly deserve it. Amazing image. Someone should stack all the exposures and see whether any forms can be seen beyond the second ring. This is a landmark observation and should be explored to the absolute fullest. Added some more text to post today. Was supposed just to provide a link to Bottlinger's paper, but somehow text just oozed out. Good luck with a good match simulation folks! As Marko says "The rings' dimensions and sun elevation are provided, so anybody can give it a try!". I didn’t myself try over hard. This was from a conviction that – like with elliptical halos – there are several parameters that can be adjusted but the simulations don’t converge much. Besides, I was still recovering from falling off the chair on first getting the images! Seriously, the simulation starts off looking promising but as the parameters are altered it doesn’t seem to get that much better. Eventually my mind starts going around in ellipses! The lack of convergence likely tells us that the underlying concepts and model need improvement. However, HaloSim and Jukka’s new HaloPoint are there – give the Bottlinger’s simulations a try! When I saw it, I really thought it must have been a window artifact. I'd never heard or read of such a display. But I took the pictures anyway, thinking that there was a chance I'd discovered a brand new phenomenon! Turns out I was wrong on both counts, and I'm so glad that the halo community has these photos now. By the way, the other people on the plane thought I was insane. I gave it a go, although very shortly. Truncating the pyramids and allowing them to have different apex angles gave an output which resembles Tim's photos. In this HaloPoint simulation the upper pyramid parameters were: apex 176.9° prism height 0.3, and lower one 179.2° and 0.5. Additionally a thin prism, with an aspect ratio of 0.05, was introduced between the pyramidal ends. This prevented some disturbing raypaths from creating unwanted halos. The simulation has room for improvement. The outer ring is a bit too small and we do not see the smallest ring in photos at all. It may be merged into the subsun, though. But who would believe such apex angles? Also, although below the horizon things are quite OK, this crystal creates fantastic prismatic arcs above the horizon, in the vicinity of parhelia. These have never been seen. One gets rid of these arcs by letting the prism go, but then other issues emerge. The riddle is far from being solved. Pretty darn good simulation Jukka! Mind you putting also the .par-file available? I think the prism is not a broblem. We have enough examples of snow star like crystals not making parhelia. Recently Jarmo observed in diamond dust circumzenith arc without parhelia. And the crystals that made the streelight Bottlinger look to me like they might as well make parhelia, but no parhelia was seen. The simulation softwares assume perfect crystals, which snow star type crystal are not. So, we must artificially shut down some raypaths when simulating these snow star displays. And I can believe also the unlikely angles. There is happening something that we don't understand yet. 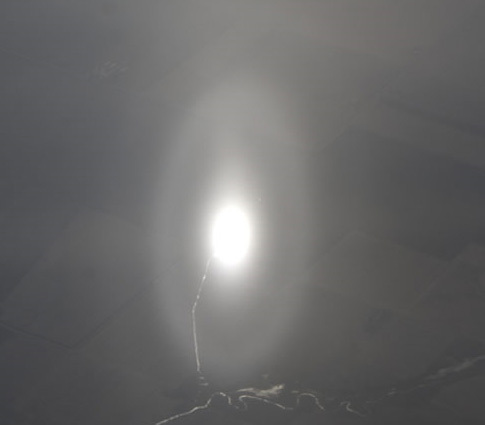 Elliptical halos and Bottlinger's rings form in special conditions from Altocumulus cloud that turn into ice crystals at around -15 C. Supersaturations are high and the short duration of existence of these halos (for elliptical halos often less than one minute) tells that the structure making these halos is very unstable. Also no other halos are seen, except for pillar. Sure, there are exceptions both on cloud types and durations, but the properties above a characteristic. Sure, here is the parameter file. You're right about the crystals. Maybe at this point we can experiment quite freely and step outside the perimeter defined by crystallographic probabilities and rules. The displays tend to be short lived, which, as you say, is a sign of highly instable conditions. Perhaps exotic facets which soon transform into something more stable. this is a great fit Jukka! this is more than a strange coincidence to me! Nicolas, thanks. The elliptical halo(s) around the Sun with the above parameters are not quite satisfactory with the Québec-ellipse display. The largest ellipse is too small, for one thing. But, one can surely find parameters with which a reasonable match can be obtained. Only minuscule changes in apex angles are required to change the sizes of the resulting ellipses. I wrestled with the Quebec display simulation for a while (and Les has also been working on it). That was still when Jukka had narrow column shaped sun in the simulation, which made the simulations look not so good with ellipses, should try again now as this issue has been corrected. That is about the best freakin example of Bottlinger rings yet!!! The faint horizontal line through the subsun is a reflection of the window sill. The Quebec elliptical with a sim is on OPOD. I don't know if you guys remember but in March 23rd 2008 I got that elliptical halo display that lasted over 2 hours and I time-lapsed it and when I paged through the pics I could see the ellipse shrink and then grow when a large piece of precipitating AC drifted in front of the sun and it would form large ellipse with 2 inner rings and they would disappear as the outer main ellipse would shrink. Someone needs to point me to a freeware I can download so I can make a movie for you all to view. I know everyone in the halo community want to see a shrinking and expanding ellipse. Marko also said that display should be in the spotlight as well at the time. Thanks Glenn for the info. Some of us have probably known about this, the photo is also (very poorly) reproduced in the Lynch et. al. paper, to which there is a link in the post. I have not seen Scorer's book, so it was nice to know what the figure caption says. Amazon.com currently lists four used copies of this book, with the cheapest available at USD11.74.